Two years into a five year transformation programme, Qantas sees the light at the end of the tunnel, reporting an underlying profit before tax of AUD192 million (USD172 million) for the financial year to 30-Jun-2013 against a backdrop of high fuel costs, excess domestic capacity and intense competition in its international markets. The result, however, benefits from an AUD134 million (USD120 million) accounting estimate change relating to bringing forward accounting of passenger revenue. Without this adjustment the underlying result would have been AUD58 million (USD52 million). But Qantas’ previously troubled international business is on the mend as the first benefits from the cornerstone alliance with Emirates begin to flow, costs are removed and loss making routes exited as well as aircraft reconfigured and alliances expanded, particularly in Asia. CEO Alan Joyce stated: “Our financial position has been strengthened by the actions we have taken over past 12 months: reducing debt, extending our maturity profile and taking a prudent approach to capital expenditure". But Qantas has not provided profit guidance for the year ahead as the operating environment in the first half of FY2014 remains volatile. The underlying result reflects the cost of Qantas moving its hub for European flying from Singapore to Dubai, the introduction of the carbon tax, back pay to pilots and additional start-up losses in Jetstar’s Asian joint ventures. The group’s financial position has strengthened with positive net free cash flow of AUD372 million (USD334 million) as at 30-Jun-2013 and liquidity of AUD3.4 billion (USD3.05 billion) and gross debt reduced by AUD1 billion (USD898 million). But underlying fuel costs for the group are expected to be about AUD2.34 billion (USD2.1 billion) in 1HFY2014 at current rates, about AUD160 million (USD144 million) higher than 1HFY2013. Group capacity is expected to increase between 1% and 2% during the first half of FY2014 while domestic capacity is expected to grow between 1.5% and 2% over the comparable periods. The Qantas International segment continues to make headway halving its underlying EBIT loss to AUD246 million (USD221 million) for the year. The long-haul business improved comparable unit costs by 5%, reflecting an AUD148 million (USD133 million) benefit for the strategic Qantas Transformation initiatives, and is now free cash flow positive. The biggest gains were made in the first half of FY2013 when the carrier turned around an AUD262 million (USD235 million) loss a year earlier to an AUD91 million (USD82 million) loss by withdrawing from unprofitable routes, retiring aircraft, refitting nine 747-400s with A380 standard cabins and consolidating operations. Mr Joyce is optimistic that Qantas will expand across a wide range of routes in 2016 as the fortunes of its ailing international operations continue to turn around and remain on track to reach breakeven by FY2015. Qantas’ ground breaking alliance with Emirates took effect on 31-Mar-2013 and which Mr Joyce credits with having revitalised his carrier’s position on the Kangaroo route. Booking for European flights are running at about twice the level compared to Qantas’ previous codeshare arrangements. However, much of the partnership will be bedded down over FY2014 and the full benefits of the alliance are expected to flow from FY2015. The two carriers also gained approvals from Australian and New Zealand authorities in May-2013 to extend their alliance across the Tasman for a period of five years. The trans-Tasman alliance commenced on 14-Aug-2013 and to all intents and purposes turns the market between Australia and New Zealand into a duopoly between the Qantas-Emirates Group and Air New Zealand-Virgin Australia partnership. Qantas and Emirates must maintain their pre-alliance aggregate capacity on the four key trans-Tasman routes – Sydney-Auckland, Melbourne-Auckland, Brisbane-Auckland and Sydney-Christchurch – where their existing networks overlap. The Air New Zealand-Virgin Australia alliance has a 51% market share on the Tasman and the Qantas/Jetstar-Emirates alliance together hold 43.7% of the market. The balance is operated under fifth freedom rights by LAN Airlines and China Airlines. Growing its Asian business remains the major priority for the Qantas Group now that the cornerstone alliance with Emirates has been largely bedded down. Shifting the hub for European flights from Singapore to Dubai freed up significant capacity between Australia and Singapore which was previously reserved for passengers flying in to Europe. Extensive schedule changes put in place have allowed Qantas to grow capacity by 40% to Singapore and 10% to Hong Kong. The new schedule timings have allowed for better onward connections on intra-Asia routes on partner carriers via Singapore, Bangkok and Hong Kong. Qantas still faces an uphill battle, however, to establish an Asian presence that can match that of the Virgin Australia-Singapore Airlines alliance. 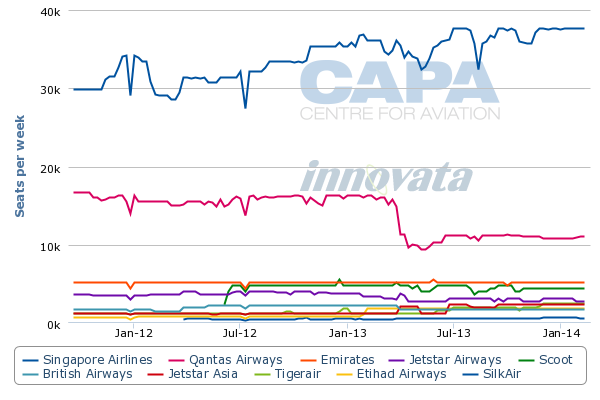 Singapore Airlines has further increased its dominance of the Australia-Singapore market in the past six months by another 3ppts to 53% while Qantas has slipped to 17% from 22%. Qantas will seek to expand its presence in Asia through both its own 'red tail' operations in conjunction with alliance partnerships and increased frequencies and on existing routes as well as adding more destinations. As part of its broader strategy to strengthen its Asian presence, Qantas significantly expanded its codeshare agreement with China Eastern Airlines in Apr-2013, giving Qantas access to a combined 17 direct services between Australia and mainland China each week with onward connections via Shanghai to 11 domestic destinations. Qantas codeshares on China Eastern’s daily Melbourne-Shanghai as well as Sydney-Nanjing-Beijing services, which operate three times weekly and China Eastern’s domestic Shanghai-Nanjing services. Qantas also has codeshare services on China Eastern services between Singapore and Shanghai, which connect to Qantas services operating from Sydney, Melbourne, Brisbane and Perth. But Mr Joyce stated that it is not possible to replicate the Emirates-style alliance in Northern Asia with a single partner. Instead each market must be addressed individually. Qantas will, however, need to find partners other than its LCC Jetstar affiliates to build its Southeast Asian network. This is its key strategic goal as the Asian market refocus continues. LCC subsidiary Jetstar reported an underlying EBIT of AUD138 million (USD124 million), down 32%, reflecting the competitive domestic market and additional start-up losses in Jetstar Japan and Jetstar Hong Kong. Jetstar’s Asia-Pacific network spans 16 countries and territories and in FY2013 reached the milestones of carrying 100 million passengers and took delivery of its 100th aircraft. Qantas is also working to improve the connectivity of mainline brand with the Jetstar’s Asian networks from Singapore as well as Japan and Hong Kong as it becomes established. Jetstar Japan, a joint venture with Japan Airlines, Mitsubishi and Century Tokyo Leasing Corporation, has followed up its strong start in the first half of FY2013, and by Aug-2013 had carried 2 million passengers. Mr Joyce said Jetstar Japan has “huge growth potential, with low-cost carriers accounting for just 5 per cent of a market that is six times the size of Australia”. Jetstar Hong Kong which is a partnership with China Eastern and Shun Tak Holdings, which became a shareholder in Jun-2013, continues to work its way through the complex regulatory approval process. The operation was formally gazetted by Hong Kong’s Air Transport Licensing Authority in Aug-2013 and the carrier continues to plan for launch by the end of 2013. The joint venture is being strongly resisted by Cathay Pacific which is not keen on allow Qantas, a fellow oneworld member, competing on its home turf. The Japanese ventures are expected to take three years to break even. Qantas domestic operation’s reported an underlying EBIT of AUD365 million (USD328 million), down 21% as yields continued to be under pressure as a result of a capacity battle with Virgin Australia, which led to about 8% capacity growth year-on-year, outstripped demand and an oversupply of seats. Mr Joyce is confident that despite the intense competition and excess capacity in the market Qantas is winning in the domestic market on all fronts. The group has maintained its 65% profit maximising market share and Qantas claims to have an 84% market share of the corporate travel market and has won key new accounts including Fortescue Metals and the Roy Hill charter contract. Capacity increases have eased on major routes in the second half of FY2013 but was still growing faster than demand, particularly in the regional markets and in the LCC segment. The next front in the on-going domestic battle could see Jetstar having to defend its position against a newly rebranded and mollified Tigerair Australia, which under 60% ownership control of Virgin Australia continues its recovery from being grounded on safety grounds for about two months in Jul-2011. The Tigerair Australia-Virgin Australia pairing will effectively seek to duplicate the Qantas-Jetstar dual brand strategy by allowing Virgin Australia to focus on its new full service offering while Tigerair Australia provides the group with the means to re-enter the LCC space vacated by Virgin Australia. With a commitment to increase Tigerair Australia’s fleet from the current 11 A320s to 23 by 31-Mar-2018, and the potential to grow to 35 aircraft, Tigerair Australia is likely to reignite an LCC capacity battle. Meanwhile Qantas’ regional domestic dominance will also be challenged by Virgin Australia which has expanded its reach in Western Australia and the lucrative FIFO market through the acquisition of Skywest. Qantas Loyalty continues to serve as the group's cash cow, recording another record underlying profit of AUD260 million (USD233 million), up 13%, the unit’s fourth consecutive year of double-digit growth and underlining its value as a stable source of revenue. Membership of Qantas Frequent Flyer topped nine million in Jan-2013 and is targeting 10 million members during FY2014. The alliance with Emirates drove a 50% increase in redemptions on partner airlines in 4QFY2013 and the programme has launched its next generation Qantas Cash loyalty card which allows members to withdraw cash and make purchases. Qantas Freight reported an underlying EBIT of AUD36 million (USD32 million) down 20% on FY2012 due to a decrease in international capacity and the sale of the group’s stake in StarTrack. Qantas also announced on 29-Aug-2013 the sale of Qantas Defence Services to Northrop Grumman for an AUD80 million (USD72 million). This follows the earlier sale of Cairns and Sydney Riverside catering centres to Gate Gourmet. Qantas' average fleet age has dropped to less than eight years, its lowest level in 20 years following a fleet renewal programme over the past five years that saw the group take delivery of 126 new aircraft for Qantas and Jetstar. Qantas has previously announced a programme to refit its entire A330 fleet from late 2014 with lie-flat business class seats and a refreshed economy cabin to cement its position on the Asian and domestic networks. Asia will be serviced with 10 A330-300s and 20 A330-200s will operate between Perth and the Australian east coast. An additional five 737-800s will also be added to the domestic network in 2014. FY2013 was a dramatic year, where the entire international strategy was revamped around the Emirates alliance and a combination of stiffening competition from Virgin Australia and a softening economy damaged yields. However, having pretty much bedded down its Emirates partnersip, Qantas continues to make solid progress in its five year transformational programme as its international business remains on course to break even in FY2015. 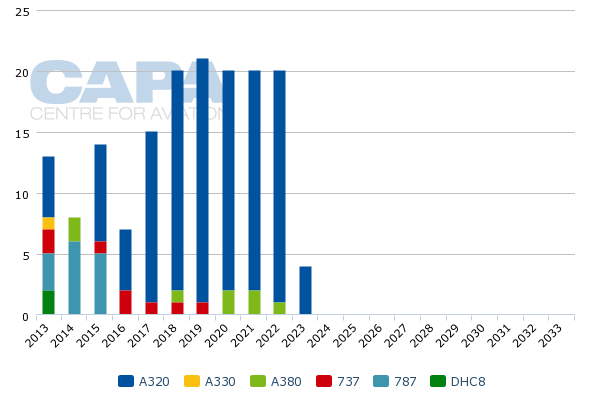 This should put the carrier in a position to prepare for widespread route expansion from 2016 when it has the ability - with substantial flexibility in its acceptance dates - to firm up options for 50 787 on order. But the immediate priority is to grow the Asian business now that the cornerstone alliance with Emirates has been largely bedded down. This will take time, because, as Mr Joyce stresses, this will not be resolved by a pan-Asian partnership, but will require more local alliances in separate markets. This implies commitment of considerable resources to the activity - made easier as the Emirates partnership appears to be bedding down well - and, in a perverse way, the ability to tailor solutions in a flexible way. Here the evolution of Jetstar in Asian markets will surely be an integral part of that future; having a Jetstar presence in many of the leading country markets will certainly offer another dimension of options. Domestically there is work to be done still. The capacity reprieve at home may be short lived as Virgin Australia and Tigerair Australia finalise their dual brand strategy and target Jetstar’s dominance in the leisure market. As the market weakens, yields will continue to suffer. Understandably, there is reluctance to commit to a firm outlook in this unstable market environment.